White feathers are pure and spiritual. These are approximately 3 - 3.5 inches long. 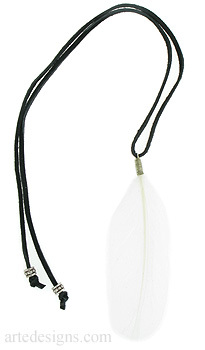 Feather necklaces are available with tarnish resistant silver or gold plated wire. Choose a 20 inch brown or black suede cord that ties in the back or an adjustable 16-18 inch sterling silver chain.